Bastrop ISD and Heart of Texas WP‘s LRNG Grant Choice and Voice Team has gotten off to a great start this school year. At the end of July we had our first meeting in the Sanchez Building of the University of Texas at Austin. It was some teachers’ first time on campus and, for others, it had been years since they had been back. We started with a webinar with Francesca Arturi from edu.buncee.com. She walked us through the multi-media presentation tool and got our minds’ reeling with ideas of how this platform will help us get students’ voices out to the world! We got to know each other and set dates for the year, paged through our book club books, About the Authors and Study Driven by Katie Wood Ray, and geared up for our upcoming work creating units of study that end in student publication in the community and online. This year, when Hurricane Harvey blew through Texas just as the school year was starting, it was impossible not to think about how the school year started in Bastrop ISD schools just six years ago. Bastrop hit national news in September of 2011 when the largest forest fire in Texas history torched more than 36,000 acres and more than 1,600 homes, including those of many teachers and students, just as the 2011-2012 school year was about to start. Though Bastrop and nearby Austin were spared major flooding during Hurricane Harvey, we are all hurting as we watch our fellow Texans affected by another natural disaster. Many of our friends and family have been affected. One of our team members was absent at our second meeting as she cared for family impacted by Harvey. The weight of this historic storm sits with us as we begin the school year. Choice and Voice team member, Meggie Smiley, teaches 3rd grade. 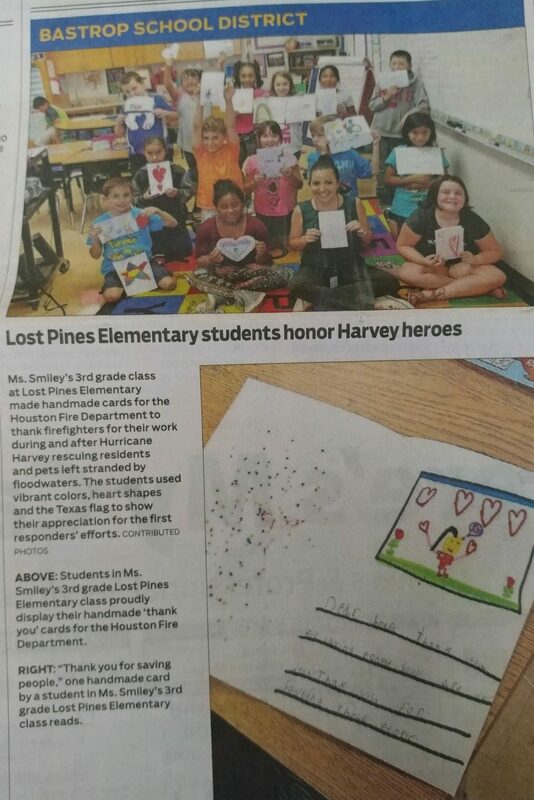 Her students were just 2 years old when the fires came through Bastrop and now, as 8 year olds, Mrs. Smiley’s 3rd graders wrote cards for the Houston firemen to thank them for helping thousands of victims of Hurricane Harvey. Bastrop and Austin newspapers have highlighted their writing. Bastrop students and teachers are no strangers to resilience and so, while the start to this school year was painful and unsettling in some ways, it also offered a reminder about the importance of community support and connectivity. Mrs. Smiley’s class used writing and audience to show support for fellow Texans. Bastrop, Texas is located 30 miles southeast of Austin, Texas. With a total of 14 schools, the Bastrop district boundary covers an area of nearly 450 square miles and includes the communities of Bastrop, Cedar Creek, Red Rock, Rockne, Paige and vast rural areas of Bastrop County. As a point of comparison, the nearby urban Austin ISD has 130 schools and covers 172 square miles. While the district boundaries contrast vastly with neighboring Austin ISD, the diversity in student demographics closely mirrors that of Austin’s urban school district. Bastrop’s student demographics include a population of 64% Hispanic, 27% Anglo, 4% African American, and approximately 3% of students identify as multiple ethnicity, Asian, American Indian, or Hawaiian. At our second meeting, we met with community leaders and had time to talk about how our project could help us bring together geographically and culturally diverse Bastrop populations. Building community despite such a wide geographic reach is one of our goals as a Choice and Voice team. We have partnered with Bastrop Library, Bastrop Parks and Recs, and We Believe in BISD to connect community and school spaces through the display of authentic student writing in community spaces. Our second meeting was held at the Bastrop Library and we welcomed Mickey DuVall and Bonnie Pierson who joined us and helped us brainstorm ways to bring BISD student work to the local library. It was moving just sitting down in the beautiful Bastrop Library, together as community stakeholders. Even with all of the intentions and plans, it seems so rare that public librarians and school teachers have the opportunity to sit down together and talk about ways to unite in our support of local youth’s growth and academic engagement. We got brainstorming about events, displays, partnerships, and new outreach to parents and to multilingual families. We thought of ways that the library can help BISD teachers and students meet goals and ways that BISD students and teachers can help the library meet their goal of reaching out to more community members. Next week, at our third meeting, Victoria Herbrich, Recreation Coordinator for Bastrop Parks and Recreation, will join us to talk about ways we might publish student writing in other community spaces. We’ll be sharing clips from our meetings here and on our new vimeo page soon!